The Freeplay Plus will be your information and light source during a power failure. It is the most sought after alternative power, AM, FM, shortwave radio in America. There's just no better choice for dealing with the frustration of a power failure. You can charge the built-in, NiMH battery pack either through the wind-up generator, the solar panel or the optional AC adapter. A fully charged battery will run the radio for over 40 hours, and when the battery gets low, you just have to wind it up. The Freeplay Plus also comes with a detachable, 3-White LED light with a magnetic base, making it the perfect combination of essentials you need during a power failure, or when you’re just "away from it all." Whether camping in remote country, playing cards in a blacked-out living room, or greening your thumb in the garden, the Freeplay Plus can go where you need it, when you want it, and without the need for any external power. 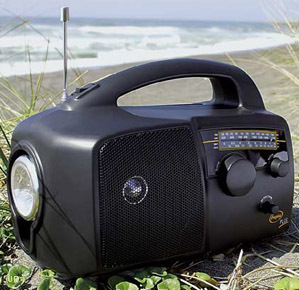 Its superior AM and shortwave reception also makes it an excellent everyday radio. Continuous coverage of ten shortwave bands from 3.0 to 18.1 MHz. Built-in stereo headphone jack (for mono reception). Weight: 5 lbs. Size: 11" W x 8" H x 8" D. With four ways to power it, the Freeplay Plus almost becomes a perpetual radio.